(Leah Hogsten | The Salt Lake Tribune) Bingham's Ameleya Angilau battles Taylorsville's Jayah Bean for possession. Taylorsville High School girls' basketball team takes on Bingham High School during their Class 6A girls' basketball playoff opener at Salt Lake Community College Tuesday, Feb. 20, 2018. (Leah Hogsten | The Salt Lake Tribune) Bingham's Shanyce Makuei hits the net. Taylorsville High School girls' basketball team takes on Bingham High School during their Class 6A girls' basketball playoff opener at Salt Lake Community College Tuesday, Feb. 20, 2018. (Leah Hogsten | The Salt Lake Tribune) Taylorsville's Finau Tonga with the rebound. Taylorsville High School girls' basketball team takes on Bingham High School during their Class 6A girls' basketball playoff opener at Salt Lake Community College Tuesday, Feb. 20, 2018. 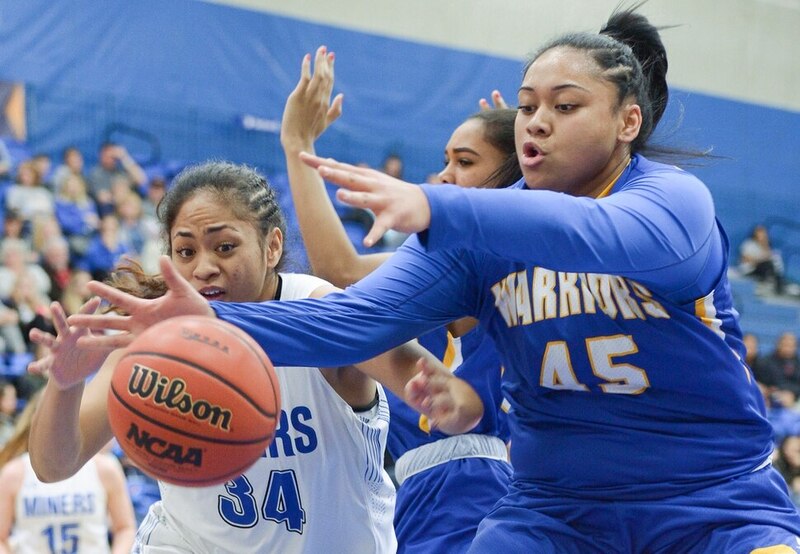 (Leah Hogsten | The Salt Lake Tribune) Bingham's Ameleya Angilau tries to get past Taylorsville's Jayah Bean. Taylorsville High School girls' basketball team takes on Bingham High School during their Class 6A girls' basketball playoff opener at Salt Lake Community College Tuesday, Feb. 20, 2018. 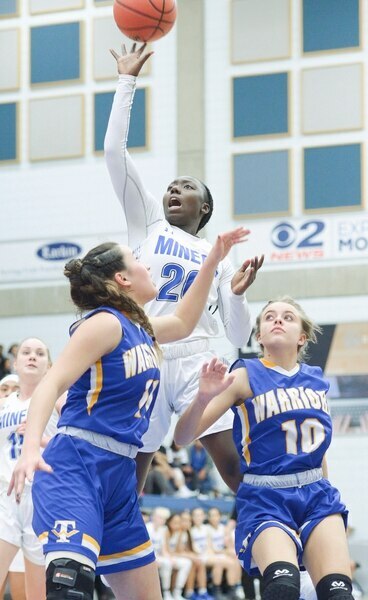 (Leah Hogsten | The Salt Lake Tribune) Taylorsville's Jayah Bean is pressured by Bingham's Courtney Hill. Bingham High School girls' basketball team defeated Taylorsville High School 46-42 during their Class 6A girls' basketball playoff opener at Salt Lake Community College Tuesday, Feb. 20, 2018. (Leah Hogsten | The Salt Lake Tribune) Taylorsville's Aubrey Yorgason for two. Bingham High School girls' basketball team defeated Taylorsville High School 46-42 during their Class 6A girls' basketball playoff opener at Salt Lake Community College Tuesday, Feb. 20, 2018. (Leah Hogsten | The Salt Lake Tribune) Bingham's Samantha Holman is celebrated by the bench after sinking a 3-pointer. Bingham High School girls' basketball team defeated Taylorsville High School 46-42 during their Class 6A girls' basketball playoff opener at Salt Lake Community College Tuesday, Feb. 20, 2018. (Leah Hogsten | The Salt Lake Tribune) Bingham's Maggie McCord for two. Taylorsville High School girls' basketball team takes on Bingham High School during their Class 6A girls' basketball playoff opener at Salt Lake Community College Tuesday, Feb. 20, 2018. (Leah Hogsten | The Salt Lake Tribune) Bingham's Jada Suguturaga pulls down the rebound. Taylorsville High School girls' basketball team takes on Bingham High School during their Class 6A girls' basketball playoff opener at Salt Lake Community College Tuesday, Feb. 20, 2018. (Leah Hogsten | The Salt Lake Tribune) Bingham celebrates the win. Bingham High School girls' basketball team defeated Taylorsville High School 46-42 during their Class 6A girls' basketball playoff opener at Salt Lake Community College Tuesday, Feb. 20, 2018. (Leah Hogsten | The Salt Lake Tribune) Taylorsville's Finau Tonga for two. Bingham High School girls' basketball team defeated Taylorsville High School 46-42 during their Class 6A girls' basketball playoff opener at Salt Lake Community College Tuesday, Feb. 20, 2018. (Leah Hogsten | The Salt Lake Tribune) Taylorsville's Morgan Toluono for two. Bingham High School girls' basketball team defeated Taylorsville High School 46-42 during their Class 6A girls' basketball playoff opener at Salt Lake Community College Tuesday, Feb. 20, 2018. (Leah Hogsten | The Salt Lake Tribune) Bingham High School girls' basketball team defeated Taylorsville High School 46-42 during their Class 6A girls' basketball playoff opener at Salt Lake Community College Tuesday, Feb. 20, 2018. (Leah Hogsten | The Salt Lake Tribune) Bingham's bench cheers for teammate Ameleya Angilau who sunk the last two shots of the game at the foul line. Bingham High School girls' basketball team defeated Taylorsville High School 46-42 during their Class 6A girls' basketball playoff opener at Salt Lake Community College Tuesday, Feb. 20, 2018. (Leah Hogsten | The Salt Lake Tribune) Bingham's Journey Tupea makes the pass. Bingham High School girls' basketball team defeated Taylorsville High School 46-42 during their Class 6A girls' basketball playoff opener at Salt Lake Community College Tuesday, Feb. 20, 2018. (Leah Hogsten | The Salt Lake Tribune) Bingham's Journey Tupea is fouled under the net. Taylorsville High School girls' basketball team takes on Bingham High School during their Class 6A girls' basketball playoff opener at Salt Lake Community College Tuesday, Feb. 20, 2018. (Leah Hogsten | The Salt Lake Tribune) Taylorsville's Finau Tonga left the game after a sprain. Bingham High School girls' basketball team defeated Taylorsville High School 46-42 during their Class 6A girls' basketball playoff opener at Salt Lake Community College Tuesday, Feb. 20, 2018. 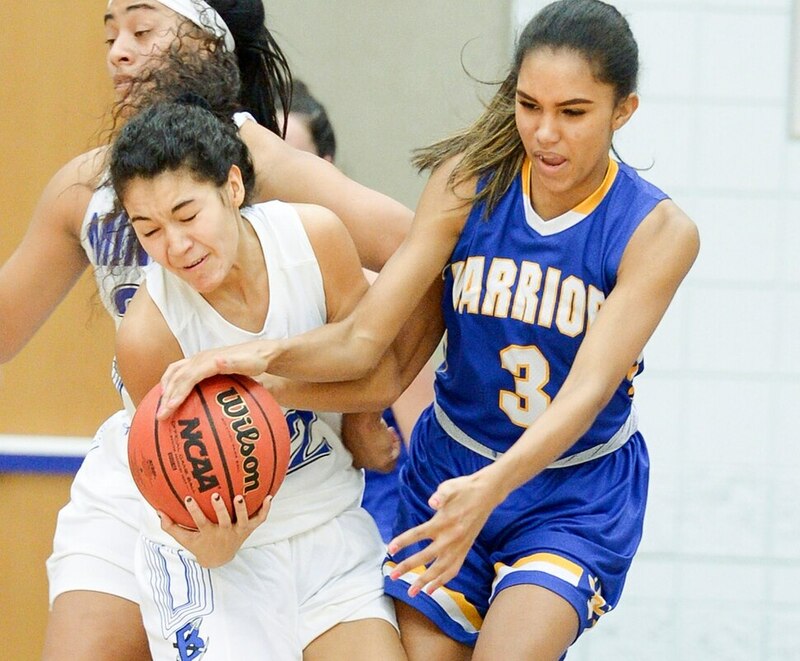 Taylorsville • Make no mistake, Bingham’s 46-42 victory against Taylorsville in Tuesday’s first round of the Class 6A girls’ basketball state tournament was earned. But the Warriors put a bow on it for good measure. Taylorsville committed 26 turnovers, including an errant inbounds pass with 11 seconds left that ended a chance for its first state tournament victory in nine years. After junior Journey Tupea’s free throws broke a 42-42 tie, senior Shanyce Makuei stole Taylorsville’s inbounds pass and Ameleya Angilau made two free throws for the final margin. Bingham advanced to the state quarterfinals for the seventh time in eight years, and third year in a row. The Miners will meet Northridge (16-5) in Thursday’s round of eight. Maggie McCord scored 11 of her 17 points in the second half and grabbed seven rebounds for Bingham. Tupea finished with 11 points. The Miners committed 11 turnovers in the first half but just four the rest of the way. Junior Aubrey Yorgason scored 17 points, including the first eight of the second half, to give the Warriors (5-17) their final lead of the game at 25-24. But mistakes are magnified on the big stage of the state tournament, and Taylorsville couldn’t escape its proclivity for giveaways. The Warriors turned over the ball eight times in the third quarter after 15 giveaways in the first half. • Maggie McCord scores 17 points and Journey Tupea adds 11 points and six steals for the Miners. • Taylorsville commits 26 turnovers and loses in the first round for the seventh time in eight years. • Bingham reaches the state quarterfinals for the seventh time in eight years and will face Northridge on Thursday.